Application : Industrial, laboratory, heating, ventilation, medical hospital, used for air or not corrosive and not ionized gas & liquid. 8 kind display units ( mbar, psi,Kg/cm^2 mm Hg, inch Hg, meter H20,inch H20, Atmosphere ) select by pushbutton on the front panel. RS232 PC serial interface, can match the personal computer used as theData Logger, Recorder.... and other modern pressure measuring system. mbar, psi, Kg/cm^2, mm/Hg, inch/Hgmeter/H2O, inch/H2O, Atmosphere. KM 8070 is an absolute pressure measuring instrument with 8 units (Pa, hPa, mbar, mmH2O,mmhg, inHG, in H2O, psi). It is normally used to measure absolute pressure, e.g. for pressurecompensation in velocity measurement in ducts, laboratories and production processes.Barometric measurement and height measurements between two points are also possible.With hold, MAX, MIN, and AVG function, KM 8080 is widely used in HVAC, Laboratories andarchitecture project. With our reputation for quality products, you can find it is the mosteconomic instruments for pressure meter. Display :- 6 digits LCD display. 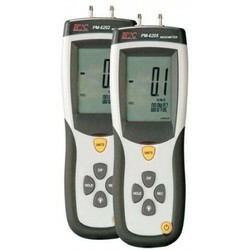 Looking for Digital Manometer ?